It’s a day full of posts for this girl 🙂 Check out my April Mixed Media Card challenge post here. And don’t forget to check out my Featured Designer post for the CAS Mix Up challenge here. Hello, my stamping lovelies! I’m a Guest Designer for a new blog hop featuring Graciellie Design’s Digital Stamps. 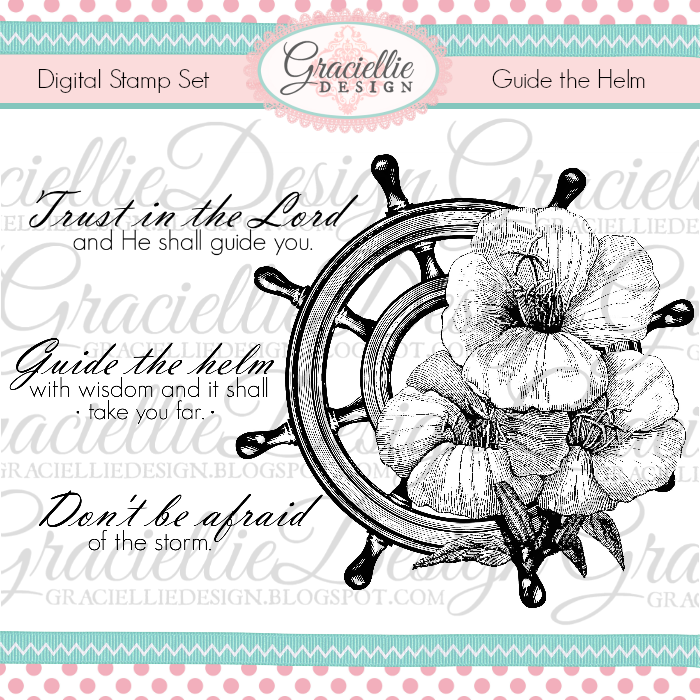 Gracie’s stamps are so versatile and today I have the chance to share a project with you using one of her sets called Guide the Helm. 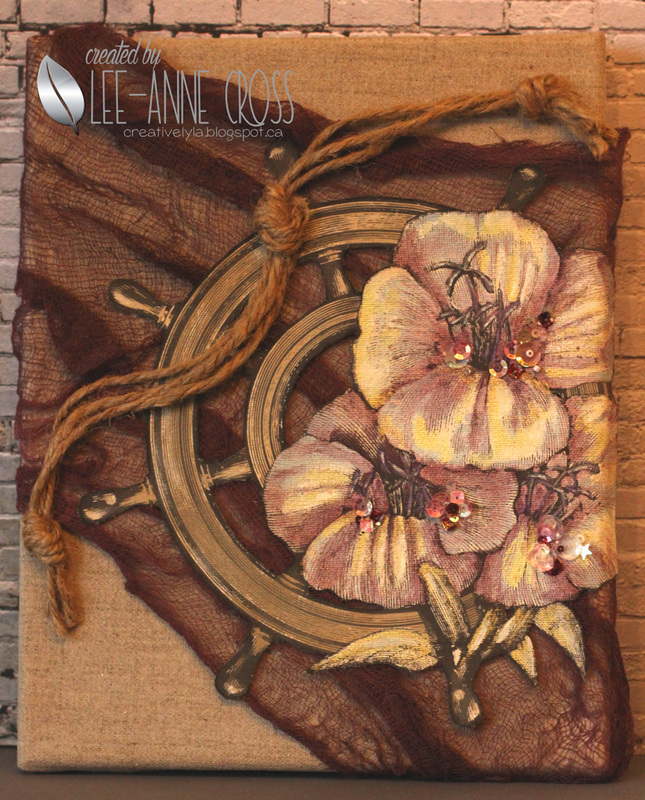 I chose to make a home decor piece and used an 8″ x 10″ burlap canvas. I printed the image on some sticky back canvas and then colored it with acrylics, watercolors, color mists and PITT big brush pens. A sprinkle of sequins and beads were added to the flowers too. I’ve dyed some cheesecloth to coordinate and place it behind the image before adhering it to my burlap canvas. Some knotted burlap twine adds a little more texture. This new, set as well as other new digital stamp sets,can be found at Graciellie Design’s shop here. If you’d like to check out last months release and inspiration blog hop click here. For a chance to win a new digital stamp set of your choice from Gracie’s shop, just comment on the blogs listed below. I’m sure their projects will inspire you! The giveaway will run for a week and Gracie will announce the winner on her blog, so don’t forget to subscribe to her newsletter here. Love that you made a piece of ART….truly! Holy cow, this looks amazing! I love to see mixed media projects using digital stamps… Your creativity sure shines through here! Love this canvas so much! Thanks for being part of this release! WOW this is absolutely fabulous! What amazing inspiration! Well done!! I am speechless.. this is amazing… WOW again.. love this digital stamp so much. Wow! Such a different feel to those images when layered up here on this lovely masculine canvas! Love the mixed media feel to this and that knotted twine is just the perfect finishing touch! Perfect images to use on this piece. Awesome. I love the muted colors and the burlap background looks so great behind the image. The rope adds that perfect bit of texture and dimension. WOWZERS!! This is such a beauty !!!! Love how the canvas came out !!! Absolutely Stunning! Gorgeous card, like your colors and design! This is absolutely stunning Lee-Anne!!! WOW.. I love the colors but more so, love the texture! I love making home decor myself… where are you going to put this? Thanks for sharing! Beautiful – this truly is a décor piece! I love your colors and textures and you've done a wonderful job of showing the versatility of these stamp sets! Wow, this is just amazing. Love your coloring so much! Beautifully done. I love your color palette and the way you have included the burlap. Just gorgeous!! Your canvas is stunning! Love the earthy tones, love the burlap, the cheesecloth & just the lovely design. Wow, this is so gorgeous. I love the colors and the dying the cheesecloth was a brilliant idea. The wonderfully colored flowers are amazing. Thank you for sharing this beautiful work of art. WOW!! Your burlap canvas is just beautiful! The colors are so pretty and I love the cheesecloth idea! The background turned out so cool~Great job! Wow! I love your beautiful project!!! !